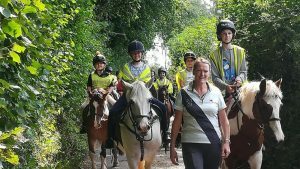 Triley Fields Equestrian Centre warmly welcomes the young and old, the nervous and the bold, there are lessons and horses to suit everyone. 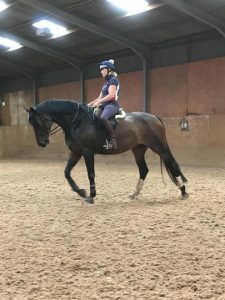 We hold daily lessons and weekly clinics to learn to ride from the very beginning to ridng dressage test, showjumping and venturing into the Cross County. We host monthly competitions and are a Pony |Club centre for ages 4-24. We hold both children and adult (age unlimited!) Campd and many other activities through the school holidays. 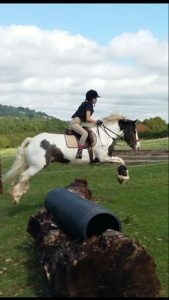 We are a BHS approved centre and have over 50 horses and ponies ranging from 10hh to 17’2hh to suit all levels of rider. 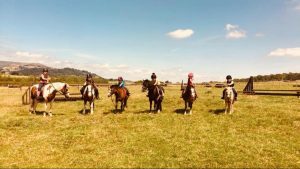 Each horse has been certified and licensed by Monmouthshire County Council and the Centre is regularly inspected and exceeds all Health and Safety requirements. All of our instructors are BHS qualified and DBS checked and we have specialist instructors for each equestrian discipline. 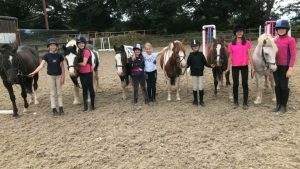 We have two indoor arenas: a larger one suitable for individual and group lessons with a viewing gallery and a small one ideal for young beginners. Outdoors we have a 40m x 40m floodlit all weather menage suitable for use all year round. In the lower meadow there is a grass competition ring for showjumping and working hunter lessons and for competition use during the summer months along with a professionally designed cross country course with fences ranging from 2’0 to 3’3 for the more adventurous. We are based on a 400 acre farm with 3 miles of tracks to hack through woodland and fields. When you first visit Triley you will have been booked into a half hour assessment lesson in our indoor arena to ensure the correct matching of horse. During this time the instructor will assess your ability to ensure you are assigned to the correct level group. Many total beginners continue with private one to one lessons for the first few weeks to build confidence and strength more quickly, these can be 1/2 or a full hour. For the more advanced rider you can progress to a more advanced group and ride in clinics with our specialist guest instructors. Lesson can be twice weekly, weekly or fortnightly. Block Booking Discount – We are offering a scheme comprising of paying in advance for 10 lessons and having an 11th free. We would like to draw your attention to our Cancellation Policy, which has been signed and agreed by all riders/riders parents on the bottom of the Rider Form. If notice is given 2 days before your lesson is due 50% of the lesson fee will be charged. If you ring on the day to cancel then full payment is due. This also applies to Pony Club sessions. Clinic and Holiday Activity Cancellations: Please note that unlike our general riding school policy our Clinic cancellation policy is that once the clinic is booked, it must be paid for. If the rider wishes to cancel unless a suitable substitute rider can be found to take your place. The Clinic Instructors still have to be paid. Likewise with the Holiday Activities, we have to book extra instructors and they still need to be paid. Please make sure you ring the office on 01873 890523. DO NOT ring Beccy or any other member of staff to cancel. This also applies if you have a horse here on livery or have a loan pony, and need to cancel lessons. We have a very long list of people who want to learn to ride, therefore, we now have a policy whereby if you do not ride for 3 weeks (without prior arrangement) you will not automatically by given your slot back and may have to join another group, or be put on a waiting list to rejoin your group.